On a visit to beautiful New Zealand in October 2015, I encountered this question: Did the moa, the large flightless, even wingless, bird of New Zealand—a cousin to the ostrich and the emu—really become extinct over 500 years ago? According to the historical and scientific evidence, the Maoris, who came in epic canoe voyages from Polynesia to settle the land in the thirteenth century (“Maori” 2016), drove them to extinction. Where once there were perhaps 58,000, by ca. 1440 there were none—due mostly to hunting (Figure 1) but also to forest clearing (“Moa” 2016). Some Maoris have even pointed to the legendary site—a Totara tree (an evergreen species) on the shore of Lake Rotorua—where their ancestors speared the last of what were once nine species of moa (Heuvelmans 1972, 134). Still, although Captain Cook made no mention of the colossal birds following his visit in 1769 (when he circumnavigated and charted New Zealand’s two main islands), in time moa sightings would be reported, and they continue to the present. As fossilized bones and tracks piqued the interest of scientists beginning in 1839, there soon became “obstinate rumors that the moa survived.” Indeed, when a German naturalist planned to climb Mount Taranaki (or Mount Egmont), a Maori chief dissuaded him, saying the mountain was guarded by a moa (Heuvelmans 1972, 137–138). The reputed survival of the moa puts it in the category of “cryptid”—that is, a supposed animal that is “of interest to cryptozoology,” the study of “hidden” animals. Cryptids are of two types: either (1) unknown species, such as Bigfoot or at one time the Mountain Gorilla; or (2) known species that supposedly become extinct but may have survived and could be rediscovered—the moa for instance (Coleman and Clark 1999, 75–77). The modern sightings begin (and Spittle’s collection of reports ends) with an encounter by three hikers about fifty miles west of Christchurch on Wednesday, January 29, 1993. 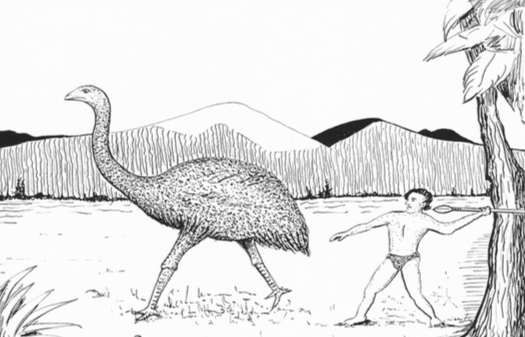 One witness was a local hotelier named Paddy Freaney; he saw and photographed the alleged bird, which he said stood about six feet tall (about half the height of the largest species of moa [“Moa” 2016]). Two others with him—Sam Waby, a school art department head, and Rochelle Rafferty, a gardener at Freaney’s hotel—also insisted they saw the bird (“Long lost” 1993). The possibility of hoaxing was soon raised. Dennis Dunbar, owner of the Moana Railway Station, told a reporter that he and Freaney had become friendly rivals in seeing who could attract the most publicity, and that months earlier Freaney had said his next exploit would be the best ever. However, Dunbar later retracted his statement (Coleman and Clark 1999, 164–167; Shuker 2003, 147–148). Denis Dutton and the Canterbury skeptics invited the trio of witnesses to a meeting, held at the University Staff Club, to take their measure. They were treated in a friendly way—Denis would have made sure of that—and he felt that given “their coherence, consistency and sense of sincerity, the three were remarkable.” He concluded that “few skeptics left the meeting thinking the moa sighting was an intentional hoax” as had been suggested (Dutton 1993). 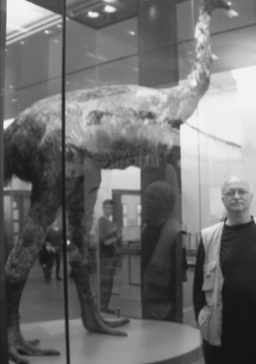 An earlier plan by the Department of Conservation to search the immediate area for tracks, feathers, droppings, or any other sign of the moa (“Long lost” 1993) was nevertheless canceled when a then-postgraduate zoology student (later paleontologist), Richard Holdaway, identified the creature in the blurry photo as a red deer, observing that the neck was too thick for a bird (“Paddy” 2012). Regarding tracks, Australian monster hunter Rex Gilroy—whose exploits I first encountered in 2000 (Nickell 2011, 91–94)—has repeatedly “discovered” moa tracks and other alleged traces in New Zealand. Unfortunately, Gilroy is what skeptics disparagingly call a “repeater”—one who repeatedly claims to have had a most unusual sighting or to have made a remarkable discovery—thus straining credibility (Nickell 2011, 68, 215–216). For example, Gilroy alleges that in Australia’s Blue Mountains (where I have also ventured), he encountered a Yowie, a Down Under version of Bigfoot (Nickell 2016). He also claims to have found Yowie tracks; sighted another presumed-extinct creature, the thylacine (or “Tasmanian Tiger”); and discovered evidence of such other cryptids as the Blue Mountain lion, the Australian panther, and the megalania (an extinct giant monitor lizard) (“Rex and Moa” 2008). In 1980, Gilroy claimed to have discovered a moa’s lower leg bone in northern New Zealand. In 2001, he claimed he discovered no fewer than thirty-five separate moa ground prints from which he infers the existence of a colony of as many as fifteen birds. In November 2007, Gilroy reputedly found evidence of a moa nest (in a rotten, hollow tree trunk) and a trail of tracks through a forest. He stated that a cast of those prints could be matched with a species known as the little scrub moa that he had viewed in the Auckland Museum (“Rex and Moa” 2008). Gilroy has also exhibited what he maintained was a fossilized footprint of the extinct giant ape Gigantopithecus, which would make it the only such print known (Healy and Cropper 2006, 50). Gilroy withholds information regarding some of his evidence, and that raises further questions. For instance, he refused to reveal the site of his alleged 2007 discoveries or to allow anyone, even a television cameraman, to visit the secret location. He says that his intent is to protect the birds, but secrecy can invite suspicion. New Zealand paleontologist Joan Wiffern—the first to discover dinosaur bones in the country—suggested Gilroy was perhaps only enjoying “a bit of a dream” (“Rex and Moa” 2008). Given the lack of any real evidence for the supposed moa survival, a moa expert at Canterbury Museum, Beverly McCulloch, stated: “The weight of scientific evidence is against it. The history of moa studies is littered with possible sightings, none of which has ever been proven, some of which were hoaxes and most of which were wishful thinking” (“Long lost” 1993). Wishful thinking could cause people to misperceive (as with reports of Bigfoot that may often be misidentifications of bears walking upright [Nickell 2013]). In the 1993 case, for example, some thought the “moa” might have been an emu, since the birds are bred on nearby farms, but local farmers insisted theirs were accounted for (“Long lost” 1993; Shuker 2003, 143–150). Nevertheless, emus do escape, and they can be mistaken for moas when they do (“Baby moa” 2013). In addition to hoaxes and misidentifications, belief in the continued existence of the moa may also have been assisted by the dynamics of folklore. Oral tradition tends to “telescope” time so that important events are brought into more direct association (Layton 1999, 25). Thus, it appears that the last moa hunt (previously mentioned) “was constantly updated to ‘grandfather’s time’ to keep it in touch with the present” (“Review” 2010). In this way stories of ancient moa encounters might seem historically much more recent and could help inspire belief that sparks more claims. I am grateful to John and Mary Frantz, whose generous financial support makes many of my investigations possible. I also sincerely thank Robert and Zalina Bartholomew, who were wonderful hosts during my 2015 visit to New Zealand. Thanks also to Craig Shearer, Secretary of NZ Skeptics Society, for his logistical assistance, and the staff of the Auckland War Memorial Museum. Baby moa. 2013. Available online at http://www.stuff.co.nz/oddstuff/8983326/Baby-moa-spotted-in-womans-garden/; accessed March 2, 2016. Coleman, Loren, and Jerome Clark. 1999. Cryptozoology A to Z: The Encyclopedia of Loch Monsters, Sasquatch, Chupacabras, and Other Authentic Mysteries of Nature. New York: Fireside/Simon & Schuster. Dutton, Denis. 1993. Skeptics meet moa spotters. New Zealand Skeptic. 30 (December): 1. Gazin-Schwartz, Amy, and Cornelius J. Holtorf. 1999. Archaeology and Folklore. New York: Routledge. Healy, Tony, and Paul Cropper. 2006. The Yowie: In Search of Australia’s Bigfoot. New York: Anomalist Books. Heuvelmans, Bernard. 1972. On the Track of Unknown Animals. Cambridge, MA: The MIT Press, 131–146. Layton, Robert. 1999. In Gazin-Schwartz and Holtorf, 1999. Long lost bird ‘seen by hikers.’ 1993. Christchurch Press. Undated clipping (January 21–26). Available online at http://forteanworld.tumblr.com/post/74367840405/articles-moa; accessed February 23, 2016. Maori. 2016. Available online at http://www.maori.com/; accessed February 23, 2016. Moa. 2016. Available online at https://en.wikipedia.org/wiki/Moa; accessed February 22, 2016. Nickell, Joe. 2011. Tracking the Man-Beasts. Amherst, NY: Prometheus Books. ———. 2013. Bigfoot lookalikes: Tracking hairy man-beasts. Skeptical Inquirer 37(5) (September/October): 12–15. ———. 2016. Searching for the Yowie, the Down Under Bigfoot. Skeptical Inquirer 40(2) (March/April): 16–18. Paddy Freaney, Moa man, is dead. 2012. Available online at http://kiwiscots.blogspot.com/2012/03/paddy-freaney-moa-man-is-dead.html; accessed February 24, 2016.
Review: Moa sightings. 2010. Available online at http://www.strangehistory.net/2010/12/22/review-moa-sightings; accessed February 23, 2016. Rex and moa articles. 2008. Available online at http://www.network54.com/Forum/93258thread/1201218041/last-1201218183/Rex+and+Moa+articles; accessed March 1, 2016. Shuker, Karl P.N. 2003. The Beasts That Hide from Man. New York: Paraview Press. Spittle, Bruce. 2010. Moa Sightings. Dunnedin, NZ: Paua Press Ltd. Cited in Review 2010.